Sometimes I get a thing stuck in my head and I just have to take care of it before I can do anything else. 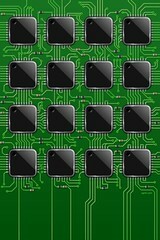 I’ve been wondering what a circuit board background would look like on my iPhone for several days and I finally just had to make one and see. I’m sure someone else out there has already made something like this (and better), but it didn’t occur to me to look until I was about halfway done. Anyway, I put them up on flickr. You can grab them there if you like. This has been my iPhone wallpaper since the day you released it. What did you make it with? I’d like to replicate this effect for the new iPad (unless you can beat me to it, of course). Thanks Allyn! I was just thinking about this today. I’m not sure I’ll be making another. I used photoshop and it was pretty tedious. I settled on one of the pictures I have on Flickr for my new iPad. But who knows, maybe I’ll find some time and make another for the iPad. Would you mind if I asked you the photoshop file to make a new one for the iPhone 5 or even the iPad ? Unless you’re working on it.